Eggs as Capital: Human Egg Procurement in the Fertility Industry and the Stem Cell Research Enterprise, 34 Signs: Journal of Women in Culture and Society 763 (2009). Reproductive Tourism: Equality Concerns in the Global Market for Fertility Services, XXVII J. L & INEQUALITY 277 (2009). Relf v. Weinberger, in WOMEN AND THE LAW STORIES (Elizabeth Schnieder & Stephanie Wildman, eds., Thompson West, forthcoming 2011). Reproductive Technologies, entry in MacMillan Encyclopedia of Race and Racism (John H. Moore, Russell Adams, John Keith Akins, Karen Brodkin, Gregory Campbell, Kevin Cokley, Patricia Hill Collins, Alan Goodman, Antoinette T. Jackson, Leonard Lieberman, Kenneth Nunn and Denise Segura eds.) (2007). Cultural Competency and Racial Disparities in Health Care, 48 ST. LOUIS U. L.J. 75 (2003). Redefining Reproductive Freedom to Build Coalition, 17 BERKELEY WOMEN'S L.J. 229 (2002). Doctrine at the Gate: Religious Restrictions in Health Care, 4 J. GENDER SPECIFIC MED. 8 (2001). Male Fraud, 3 J. GENDER, RACE and J. 511 (2000), reprinted in Critical Race Feminism: A Reader, 2D ED. (Adrien Katherine Wing ed., New York University Press, forthcoming Spring 2003), Law Through Asian American Eyes: A Critical Inquiry for Multi-Racial America (Eric Yamamoto, Chris Iijima and Angela E. Oh eds., New York University Press, forthcoming 2003); 22 U. CINN. IMMIG. and NAT'LITY L. REV. (forthcoming Fall 2002). Lessons from the Titanic: Start with the People in Steerage, Women and Children First, in Mother Troubles: Rethinking Contemporary Maternal Dilemmas (Julia E. Hanigsberg and Sara Ruddick eds., Beacon Press 1999). Forced Cesareans, 10 CURRENT OPINION IN OBSTETRICS AND GYNECOLOGY 465 (Carole Archie ed., Lippincott Williams and Wilkins Press Dec. 1998). The Fuzzy Logic of Race and Gender in the Mismeasure of Asian American Women's Health Needs, 65 UNIVERSITY OF CINCINNATI LAW REVIEW 799 (1997), reprinted in Readings on Feminist Theory (Nancy Dowd and Michelle Jacobs eds., New York University Press, 2002). The Jurisprudence of Yogi Berra, 46 EMORY LAW JOURNAL 697 (1997)(by 39 authors). The Racialization of Genomic Knowledge, 27 SETON HALL LAW REVIEW 937 (1997). 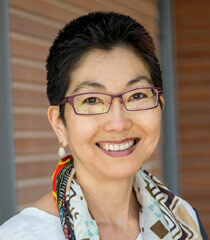 In Sisterhood, 2 MICHIGAN JOURNAL OF RACE and LAW 513 (1997)(reviewing Mari Matsuda, Where is Your Body? (1996)). Foreword, Symposium: Using Law and Identity to Script Cultural Production, 17 LOYOLA ENTERTAINMENT LAW JOURNAL 517 (1997). Some Tips on How to Endanger the White Male Privilege in Law Teaching, 19 WESTERN NEW ENGLAND LAW REVIEW 79 (1997). When a Hospital Becomes Catholic, 47 MERCER LAW REVIEW 1087 (1996). The In/Fertile, the Too Fertile, and the Dysfertile, 47 HASTINGS LAW JOURNAL 1007 (1996), reprinted in Mary Joe Frug, Woman and the Law Casebook 2D ED. (Judi Greenberg, Martha Minow and Dorothy Roberts eds., Foundation Press, 1998). Race Under Construction: The Master Narrative of White Supremacy in the Media Representation of African American/Korean American Conflict, in Feminism, Media and Law (Martha Fineman and Martha McCluskey eds. Oxford University Press 1997). Destabilizing Thoughts on Surrogacy Legislation, 28 UNIVERSITY OF SAN FRANCISCO LAW REVIEW 633 (1994). Traces of the Master Narrative in the Story of African American-Korean American Conflict: How We Constructed 'Los Angeles', 66 SOUTHERN CALIFORNIA LAW REVIEW 401 (1993), reprinted in Critical Race Theory: The Cutting Edge (Richard Delgado ed., Temple University Press, 1995); Critical Race Theory Reader, Vol. III (E. Nathaniel Gates ed., Greenview Press, 1997); Critical Race Theory: Readings on Race and Law (Alex Johnson ed., West Publishing, 1998); Critical Race Theory: The Cutting Edge, Second Edition (Richard Delgado and Jean Stefancic eds., Temple University Press, 2000); A Reader on Race, Civil Rights, and American Law: A Multiracial Approach (Timothy Davis, Kevin R. Johnson, and George A. Martinez eds. 2001); Law Through Asian American Eyes: A Critical Inquiry for Multi-Racial America (Eric Yamamoto, Chris Iijima and Angela E. Oh eds., New York University Press, forthcoming 2003). Furthering the Inquiry: Race, Class, and Culture in the Forced Medical Treatment of Pregnant Women, 59 TENNESSEE LAW REVIEW 487 (1992), reprinted in Critical Race Feminism: A Reader (Adrien Katherine Wing ed., New York University Press, 1997). Review Essay, (reviewing Don Herzog, Happy Slaves: A Critique Of Consent Theory, 8 NEW YORK LAW SCHOOL JOURNAL OF HUMAN RIGHTS 321 (1990). Book Review, (reviewing Martha A. Field, Surrogate Motherhood: The Legal And Human Issues (1988)), 8 LEGAL STUDIES FORUM 321 (1989). Providing Protection for Collaborative, Noncoital Reproduction: Surrogate Motherhood and Other New Procreative Technologies, and the Right of Intimate Association, 40 RUTGERS LAW REVIEW 1273 (1988). In the Shadows: Women of Color in Health Disparities Policy Work, 39 U.C. DAVIS. L. REV. 1023 (2006). Race to Health: Racialized Discourses in Transhuman World, 9 DEPAUL J. HEALTH CARE L. 1103 (2005).